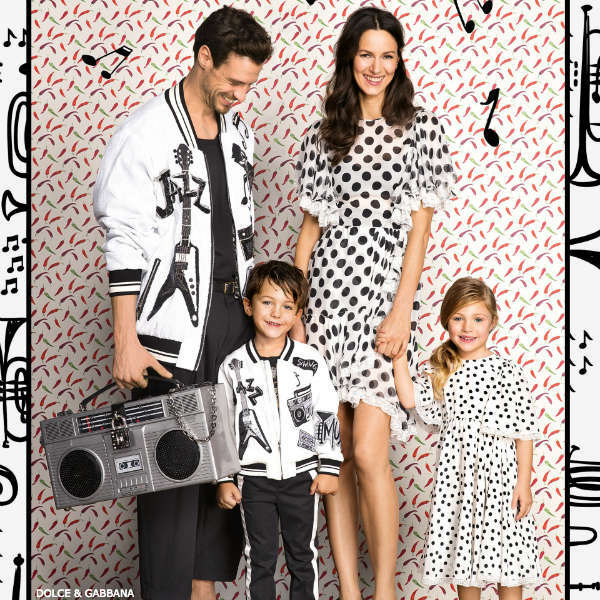 Your little guy will look so adorable wearing this Dolce & Gabbana boys mini me white bomber jacket with musical appliqué. Taken directly from the Dolce & Gabbana Men's Spring Summer 2017 Collection, this jacket is designed in a varsity, up-beat and groovy design. Perfect for special occasions or to jazz up everyday outfits, this jacket is embroidered with an array of music-inspired themes, including an electric guitar, stereo, musical notes and references to jazz and swing. Complete the look with a black stereo t-shirt and Boys Black Trousers with White Trims. Don't forget to add a pair of Boys Black & White Leather Brogue Shoes! This adorable Daddy & Me Look was featured at the Spring Summer 2017 Runway Show during Milan Fashion Week.